The University needs your help! The proposed budget outlined by Gov. Rauner calls for a 31.5 percent, or $209 million, reduction in state funding support for the University of Illinois. The University of Illinois would like to encourage you to voice your opinion on how these drastic cuts could affect your Alma Mater. You can personally vouch for the quality of a University of Illinois education, and it is imperative that you share the story of how your education helped shape your professional and personal life. 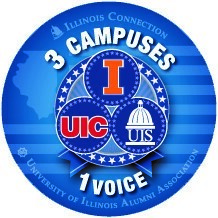 An email or call to your elected representatives in support of the University of Illinois will go a long way in helping to communicate the value of the University and higher education. For each dollar in direct appropriations, the University of Illinois leverages more than $4 in non-state funding. From 2010-2013, the University of Illinois was responsible for nearly one-fourth of the startups created at Illinois universities. It currently is ranked fifth among public universities for producing venture capital-funded entrepreneurs. The majority of these companies remain in Illinois. In Illinois, one in three pharmacists, more than 40 percent of the dentists and one in six physicians graduated from UIC. UIC has the largest medical college enrollments in the nation, and a comprehensive set of health-care colleges. More than 1.5 million Illinois residents take part in Illinois Extension programs each year, including nearly 200,000 who participate in 4-H youth programs. Communities are directly served by Extension staff in 27 units located throughout Illinois. Please consider taking action today through the Illinois Connection website before our appropriations hearing on March 19. By doing so, you will be able to contact your state legislators as well as members of the Senate Appropriations Committee and the House Higher Education Appropriations Committee. It is important that U of I alumni have their voices heard. Visit the University of Illinois State Relations website for more information on the University's position and talking points, and instructions on how to contact your legislators. You also can sign up for Illinois Connection or the State Relations newsletter to receive up-to-date information from Springfield. Questions? Call the Illinois Connection staff at the UI Alumni Association at 1-800-524-1420 or email illinoisconnection@uillinois.edu. Thank you for your ongoing loyalty to the University of Illinois.